Glaciers in the high mountain regions of the Himalayas offer a different picture to our Alpine glaciers: many of them are completely covered in debris, and many areas are overlooked by steep ice walls — vertical cliffs up to 30 metres high. From a distance, this makes the glacier surface look like the warty skin of a toad. 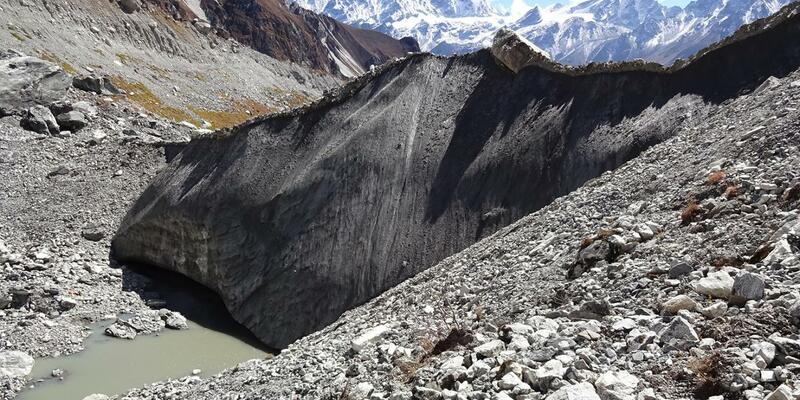 Multiple studies suggest that ice cliffs could be responsible for a large part of the high volume loss, as alongside the insulating debris, another characteristic feature of high-altitude Himalayan glaciers is steep ice walls. Researchers now suspect that these ice cliffs convey large quantities of atmospheric heat into the ice and so contribute to glacier melt. This seems at first to be a paradox: south-facing cliffs receive much more direct solar radiation than north-facing ones. However, this increased exposure to sunlight means they disappear more quickly than north-facing ice cliffs. South-facing cliffs melt irregularly. The upper section, which receives more sunlight, melts quickly, while the more shaded lower section melts less and more slowly. The ice cliff thus becomes increasingly flat, and once it reaches a slope of about 35 degrees, debris reburies it and gradually shielding it from the sun.